Contrary to popular belief, you can elevate your outfit without resorting to skyscraper heels. 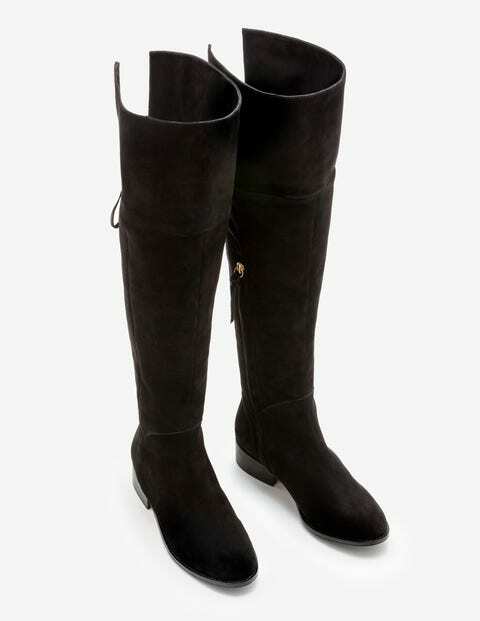 Our flat suede boots are lined with leather for comfort. The just-above-the-knee height makes them the perfect accompaniment to your favourite skirts and dresses, while the self-tie bow at the back gives an adjustable fit. We've even added an elasticated section and a zip, so these are the definition of chuck-on-and-go shoes (in the Boden dictionary, anyway).